We open with Gnarrk, Wally and Ivy narrating the reasons they are at Sanctuary. We follow with Harley's arrival at Sanctuary, as she needed to be with her friend and ally Poison Ivy. Wally continues to show his struggles of adjusting to a new reality, where his family no longer exists, and he is alone. Gnarrk recounts his early prehistoric history. We end with Harley seeing Booster murder everyone at Sanctuary, learning that she is innocent of the whole situation. Story - 5: A depth filled exploration of emotion, heartache and tragedy. Reading this issue, made me feel for those in the real world, who are in sometimes impossible situations, that they cannot control or escape. With this issue Tom King made me think about people I interact with on a daily basis, and reach out and just be there more for them. To top it all off, he didn't even need to use Superman to inspire me, to do so. When any form of writing can get you to reassess and react in a more positive way, the writer has done their intended job... But here's the kick... I'm not sure that this was even the purpose of King's issue, it just hit a nerve. Now I can't speak for anyone else on any other site that will review this issue, but I can say that this is what I personally took away from it. Last issue, King wrote Superman spot on, just as the character should be written, this issue, he illustrated how different people from different walks of life go to seek out help. 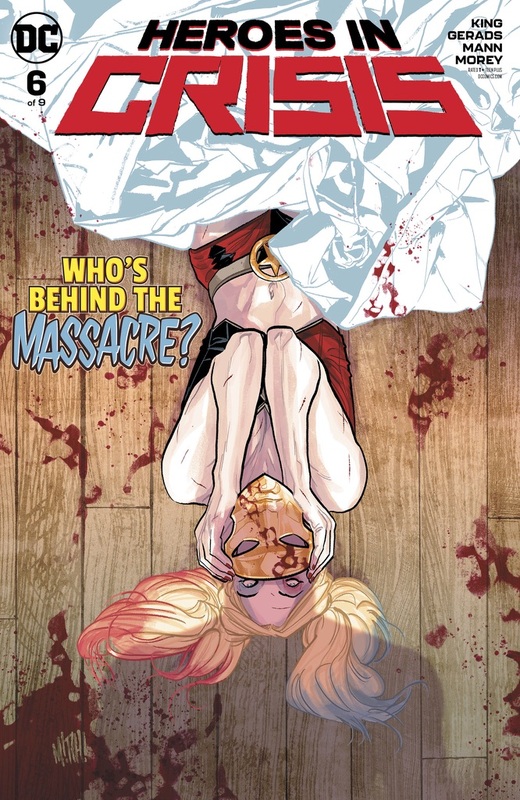 I absolutely loved the way King wrote this issue, in regards to the mental state of Harley, and just how difficult life can be for her, on top of being already considered broken. I liked King's approach to the love that Harley and Ivy share, taking away the sexual connotations, and showing us the love and support a best friend, ally and even a sister-like person can do for a person in need. Harley's struggles with The Joker as well as her own broken psyche, is what made her seek out Ivy at Sanctuary, and what she doesn't realize is, that it also enabled her to be with her in her final moments. Genius writing in my opinion. Harley isn't the only star of this issue, Wally West also takes the lead, and we learn of his struggles of coming back into a world that is not his on anymore, where his family ceases to exist. We see the agony that Wally was in, which I feel is more of a survivor's guilt than anything else. King shows just how extremely lonely Wally feels without his family, and even though he is surrounded by his friends, mentor and support system in Sanctuary, the loss is overbearing. The worst part is, his wife is here, but no longer has any memory of him, and his children have ceased to exist. I also loved the call back to the DC Rebirth Special, with the scene of Barry and Wally embracing. 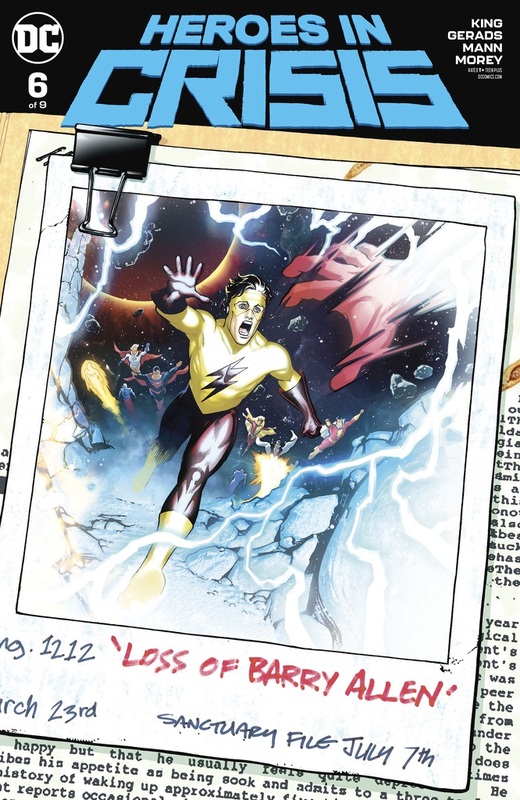 Another piece of gold in King's writing this issue is the commentary regarding Wally's continuity issues and history. I really enjoyed the way King weaved it all into the narrative. Also the scene with Harley and Ivy, when Harley is trying to play down her own mental health issues, with Ivy comforting her. The dialogue between the two is so real and natural, it puts Bendis to shame. Lastly I need to end with the on-going mystery, as we learn in this issue, that Harley sees Booster commit the murders at Sanctuary, meaning that there is something more and sinister at play. My money is still on Sanctuary somehow gaining sentience, and possibly even Skeets having something to do with it. This is a great series, and I am enjoying the psychological aspect of it. I love the way King has developed it, even though it has dragged in previous issues. I urge anyone not currently reading this, to consider picking it up. Art - 5: Again we have a guest artist, taking away Clay Mann's art for a majority of the issue. I'm not sure if this is by design, with this issue being a flashback in its entirety. Mitch Gerads outdid himself by bringing such emotion to every page. And his style is in the same sensibility as Mann's, so the change is not so drastic that it takes you out of the story. My favorite page is the splash, where Harley and Ivy are holding each other and the word balloons spiral down to the image below. There is a lot of negative space on the page, but it works so effectively with the way the word balloons are placed. This is the page I'd love to own from this issue, absolutely gorgeous piece of art. Another page that really caught my eye was the one featuring Wally, as he takes off the Sanctuary robes, and then his Flash suit, and lies in bed as Wally. The sorrow in his face in the last panel, coupled with the bird's eye view of the rest of the panels on the page is some fantastic sequential storytelling. Even though I dislike very much when an artist changes during a mini-series, I take my hat off to James Rich the editor, for finding and keeping the art in line with the look Mann has established for the book. The coloring technique was a lot different to what we have been used to in the series so far, but Tomeu Morey (the series colorist) managed to take what Mitch Gerads did, and bring it to life in a most spectacular way. Just goes to show that the colorists are unsung heroes of the industry. Cover Art - 5: I love this cover. I love the connotations behind it. I love the composition. I simply love the way it looks. Variant Cover Art - 5: This snapshot of the past, is from Crisis of Infinite Earths, when Barry Allen sacrificed his life for the greater good. Never saw it from this perspective before, an excellent angle seeing things from Barry's eyes.